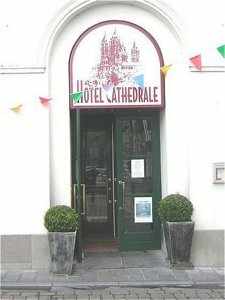 Hotel Cathedrale has 59 comfortable and nicely decorated rooms with view over the huge Cathedral, the Place st Pierre or the indoor patio.The restaurant welcomes you every evening (except sunday) for a nice dinner. Take the E42, from Paris or Brussels, exit 34 and follow the town center. Restaurant 'La Promenade' is open every evening from 19 pm to 22 pm (except Sunday)and Sunday from 12 am to 14 pm. We serve french cuisine. We have 4 meeting rooms up to 250 persons. We also organise banquets, weddings, family and business parties.